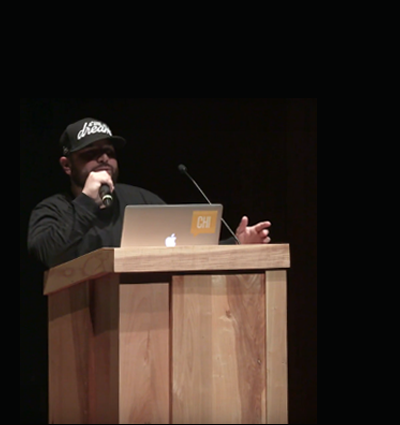 At the start of his June 2017 talk at Chicago’s CreativeMornings gathering, Puerto Rican street artist JC Rivera revealed that he didn’t make a habit of speaking publicly. “I paint, and that’s what I do. Pretty sure this is going to be the only time I do this, ever.” This sentiment is shared by many creative types who would rather do the work than talk about it. 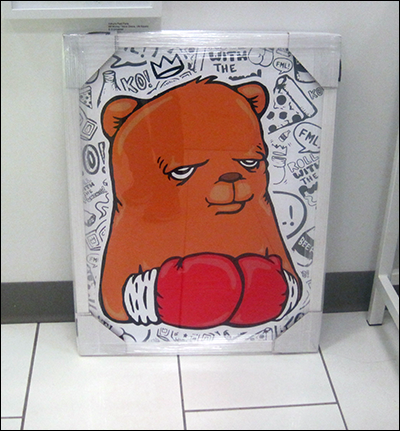 The Bear Champ is a recurring character in Rivera’s work, sparked by his childhood dream to become a boxer, but not pursued due to his Mom’s disapproval. Since then, the character evolved into a symbol of Rivera’s ambition to “roll with the punches” in his determination to make art and be a working artist. The only way in living the dream is by going through all of the experiences: good, bad and in between. His reluctance to talk about his work reminded me of the veteran-and-vanguard sign painter Ches Perry—selected to be the speaker for the CreativeMornings/Chicago-chapter meetup in July 2014 (read my write-up). Perry’s adult son did most of the talking as he shared the stage with his sign-painter father. 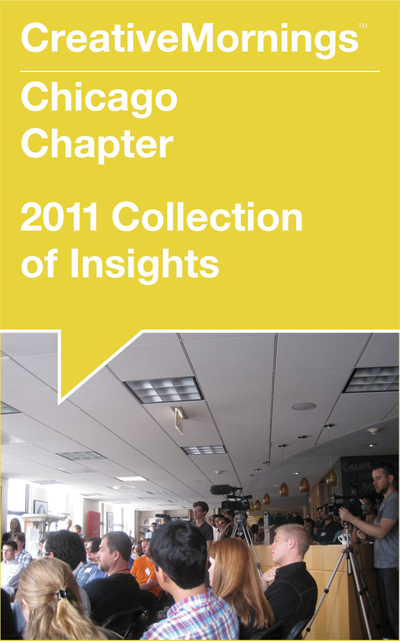 This was one of the rare times that a CreativeMornings/Chicago-chapter talk was presented in the format of an interview. After the interview, father Perry gave a demo of his sign-painting skills. I was delighted to snap step-by-step photos of this cunning performance involving ink, letterforms and truly steady hands. It was magnificent proof of a craftsperson making the work and letting it speak for itself. The work itself: its mechanics, its manifestations, its mania. This is where creative folks like Perry feel at ease. It’s where Rivera is also in his element. At the end of his talk, Rivera highlighted another discipline he practices—helping others succeed. One way he does this is by steering aspiring artists, the ones recognized as “really, really good,” to opportunities resulting in awareness for them and their work. As I write this, it is the birthday (9-17-1935) of author Ken Kesey, who wrote the novel “One Flew Over the Cuckoo’s Nest” (1962). He also encouraged the act of giving props to others, fellow writers in this case, on the same path toward closing the gap between self-doubt and success. His affirmation: “It is important to support everyone who tries to write because their victories are your victories.” Satisfying to know Rivera’s alignment to the advocacy of peers, whether established or emerging. All sharing the same communal decision to try realizing their take on creativity—and keep at it like a chisel. Coincidentally, last August, I stopped by printmaking and street art showcase Galerie F at the Chicago Design Market, the debut pop-up store rotation managed by the Chicago Design Museum. While chatting with Galerie F’s founder, Billy Craven, I spotted a poster, beaming with character. Big thanks: to AgencyEA, Dark Matter Coffee, Event Farm, Green Sheep, Lyft Chicago, University of Chicago’s Reva and David Logan Center for the Arts (who hosted), for being Partners of Chicago CreativeMornings #64; to new organizer Jen Marquez who accepted the chapter’s hosting responsibilities from Knoed Creative who spoke at Chicago CreativeMornings #7; to the team of volunteers for greatly helping to have CreativeMornings happen monthly in Chicago.